Provide comfort for the family of Ruth Browne with a meaningful gesture of sympathy. Mrs. Ruth L Browne was born as Ms. Ruth L Scott on January 31, 1928, in Harlem Hospital. She grew up in East Harlem and was the first born of four children. Mrs. Ruth Browne was educated in the New York School System and graduated from the H.S. Of Needle Trades. She married at the age of eighteen and was the mom of three sons: Emmett Browne, Marvin Browne, and Kevin Browne. Mrs. Browne always had two jobs and was a hard worker until retirement: Retiring from the MTA as a Token Booth Clerk and from Bloomingdales. She was highly involved in her community serving as a Secretary for the Eastern Stars and the NYC National Caucus and Center on Black Aged, Inc. Ruth and her sister Doris (Buzzy) were traveling companions going on numerous bus trips and outings together. Mrs. Browne’s hobbies were needle-point, crocheting and quilting. She appreciated a lot of alone time working on her crafts sitting in her Lazy Boy recliner. Mrs. Browne loved to look good at all times. She had a large wardrobe of clothes shoes. Mrs. Browne, affectionately known as to those who knew her best, departed this life on Thursday, March 14, 2019. She leaves to grieve her passing her sons Kevin and Marvin, her sister Doris Thomas (Buzzy), her grandchildren Emmett and Tiffany Browne, great-grandchildren Jazmyn Crowley, Josiah & Jaelah Velazquez, niece Jean Chatman, nephew Guy Thomas and a host of great nieces, nephews, cousins and a wonderful extended family and friends. 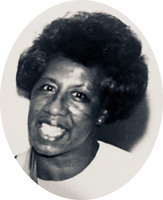 Mrs. Ruth Browne was well respected and loved by everyone she encountered due to her honest and direct nature. To send flowers in memory of Ruth Browne, please visit our Heartfelt Sympathies Store.